Lois Davis Atwood of 229 Medway St, Providence, wife of Preston A. Atwood for 72 years, died peacefully on March 31, 2019 at Bethany Home surrounded by her family. Born in Providence in 1923 and raised in Georgia, she was the daughter of Walter Thomas and Lois Bennett Davis of Macon, Ga.
She was a graduate of the University of Chicago (1944) and had studied short story writing with David Cornel De Jong. She was a book reviewer for the Providence Journal from 1948, a theater reviewer for two years, and also reviewed plays for 25 years for the R.I. Jewish Herald (which she edited, 1964-68). Shortly after World War II ended, she became head of the Publications Unit of the Charleston (SC) Navy Yard. She worked at Brown University for nearly 24 years, at the University Press and in the Religious Studies and Human Resources Departments. She was a member of the original Master of Arts in Teaching, Save the Trees, and Sarah Doyle Women’s Center Advisory committees. 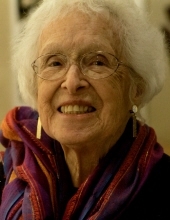 An enthusiastic mountain hiker and sailor, she was a life member of the Appalachian Mountain Club; and a member of the Players (at Barker Playhouse), St. Martin’s Episcopal Church, and the Providence Art Club, which in 2007 awarded her the Art Club Medal. She had been a member of the R.I. Chamber Music Concerts Board. She is survived by her husband, two sons David A. Atwood of Arlington, VA and John B. Atwood of Natick, MA, and three grandchildren, Paul, Judith, and Jacob Atwood. A memorial service will be held at St. Martin’s Church, 50 Orchard Avenue, Providence on Saturday, April 6 at 11:00 AM with reception to follow. In lieu of flowers, contributions may be made to St. Martin’s Church, Orchard Ave., Providence 02906 or the Appalachian Mountain Club, 5 Joy St., Boston, MA 02108. To send flowers or a remembrance gift to the family of Lois Davis Atwood, please visit our Tribute Store. "Email Address" would like to share the life celebration of Lois Davis Atwood. Click on the "link" to go to share a favorite memory or leave a condolence message for the family.